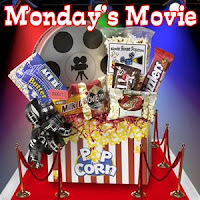 Musings of a Bookish Kitty: Monday At the Movies: Push Review/What's Wrong With Me? Monday At the Movies: Push Review/What's Wrong With Me? Push is one of those films that I went into not expecting all that much. I was just looking to be entertained for a couple of hours. Push served just that purpose. I actually liked it a little more than I thought I would. While predictable in some ways, it was not in others, which made it all the more interesting. I loved Dakota Fanning's character. She was spunky and smart. I liked that the movie was set in Hong Kong. It was an interesting nuance. I always leave these types of movies wondering which power I would like to have if I lived in a world like the one in the movie. More often than not I would choose telekinesis, the ability to move objects with my mind. While it would be interesting to see the future, I'm not sure I would want to know. The screamers seemed a bit silly to me, but it obviously came in handy in the movie. What about you? What super power would you most want to have if you were able? Ever get excited to see some movie the whole world has been gushing about, only to discover that you thought it was a dud? Not only are you completely annoyed that the movie didn't meet your expectations, but you don't have anyone else to complain to because you're the only one who didn't like it. Lonely days. Well, here are a few that Molly just didn't get that lots of others loved. Share on your blog movies you didn't see what all the fuss was about and link back here at The Bumbles. And don't forget to visit your fellow participants! I mentioned today's topic to my husband last night and his first comment was, "Are there any movies you don't like?" There had to be at least one. Since I tend to forget books and movies I'm not especially enamored with as quick as I can, I decided to refresh my memory by visiting Netflix and looking over the movies I rated the lowest. Huh. I have never even heard of that movie Push! Generally I guess movies like that are off my radar. I find this week's topic from the Bumbles interesting. On most weeks, you always see overlap, but I doubt we will see that today. I liked all of the movies you listed! I'm sure people will think the same thing with my list! I liked Push quite a bit. Dakota Fanning's character was very cool. I found the abilities presented in this film interesting. The screamers were weird, but as you pointed out, necessary. I'm not sure what power I would want. Knowing the future would be scary. I liked American Beauty, but it was strange. When we were eating lunch yesterday, I overheard one of the servers talking about seeing Shutter Island this weekend. He hated it and just kept talking about it. I told my husband that he probably wouldn't like it because he hadn't liked either of the previous movies we had seen that were adaptations from Dennis Lehane's books, Mystic River and Gone Baby Gone. He found them too dark and dreary. I also was disappointed by Lost in Translation, which surprised me. I'm usually a fan of Bill Murray. I went into watching Push with no expectations and like you, found myself enjoying it more than I thought I would. It was fun, nothing too serious. The list of movies I didn't like that others loved would be long. I would have to start with Titanic and Napolean Dynamite. I won't list anyothers because it would take the rest of the day. I love movies but I'm amazed somtimes by which ones become smash hits. Hm, what superpower would I want? Maybe to be able to read really fast?! I'm with you on Sideways - I just never did figure out the appeal of that movie. I liked Push, too - and those Screamers freaked me out! I didn't like American Beauty or Sideways. A totally mainstream movie that I didn't like was Saving Private Ryan - but it's almost sacrilegious to the war movie genre to admit it. Is surviving without sleep a superpower? Then I could stay up all night reading! 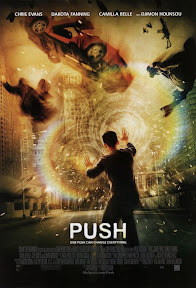 I would usually like movies like Push, but I just couldn't get into this one. Seeing that you were reviewing a movie called Push confused me for a minute, since I thought you already had. Then I realized I was thinking of the movie Precious which was based on the BOOK Push. I am easily confused, it seems :-). I love A Fish Called Wanda :-). Wow, this is one I have never heard of and I love Dakota Fanning...she is so talented! I would definitely not like to be able to look into the future unless I could only see good things! It would be nice to have power for one day...just long enough to win the lottery by knowing what the winning numbers were going to be! Push...I went into it like you not expecting a whole lot and so I actually liked a bit better than I thought I would. Great review. Haven´t seen your list except for Raising Arizona which I thought was really hilarious. Out of the ones that you didn't care for I only liked one- American Beauty!! Push sounds like it could be promising!! This sounds like that new M. Night Shamalayn movie--The Airbender or whatever it's called. Finally! I was trying to respond to all your wonderful comments and couldn't get through for some reason. It was a fun meme today and I've enjoyed reading everyone's answers. I tried to pick ones that I knew just about everyone I know liked. Movies I feel I should have liked but for some reason didn't. My husband really liked American Beauty. I might have liked it, but I couldn't get past the fact that Kevin Spacey's character molested that girl. I found it disgusting, especially since he knew she was underage. I'm eager to see Shutter Island. I'm not a huge horror movie fan, but I do like Dennis Lehane's writing. And unlike your husband, I like dark and dreary. I'm not sure how my husband will take to it when we eventually see it though. Amanda - I expected to like Lost in Translation too. I just didn't get the appeal in the end though. It's one of my husband's favorites though. Ryan - Exactly! Push was a fun movie. It was good for a rainy day. The more I think on it, the more movies I can think of that should go on the list. I haven't seen Napolean Dynamite, although it's come highly recommended. I just haven't worked up the interest yet to see it though. Kathy - Ah ha! I want that ability too! To read fast, retain what I read and enjoy it all the while. That would be a great super power. Yeah, I still don't see what my husband saw in Sideaways. Carrie - The Screamers freaked me out too. Such a weird power to have. How could you not like Saving Private Ryan? That is sacrilege! Just kidding. I really liked it, but a good friend of mine disliked it. Softdrink (Jill) - I like that idea! Think of all the books we could read if we didn't have to sleep. I wanted to like A Fish Called Wanda, but I couldn't really get into it. My husband liked it though. Kathleen - I agree. Dakota Fanning is very talented. I don't think I'd be able to handle the gift of seeing the future well. Staci - Push was fun. Not much too it, but fun, just the same. Heidenkind - It does, doesn't it? I thought so when I first heard about Airbender. M. Night Shamalayn always has his own little twist though. I'll be curious to see what he's come up with. Nicole - That's a good one! Like Piper from Charmed. :-) At least the freezing time part. Haven't seen the first two, but I totally agree on the last 3, Beauty, Wanda, and Arizona. I don't get it! I am totally with you on Lost in Translation and American Beauty. While I enjoyed Sideways I didn't see what all the fuss was about. This was a fun week for the meme! Wow - I've never met anyone who didn't like Raising Arizona! I can understand A Fish Called Wanda requiring a certain taste in humor. I suppose humor in general works that way. I agree completely with Lost In Translation and Sideways. I was a bit indifferent to American Beauty - though I have a feeling if I watched it again I'd probably enjoy it more now that all the hyped expectations have gone away. Stacy - It was fun! I think I'm more passionate about movies I didn't like than books. But I tend to have more book favorites. Bumbles - I don't know many people who didn't like Raising Arizona either. It's not one I admit to not liking very often. I might be with you on American Beauty. Maybe I'd like it better if I saw it again. I just can't bring myself to want to. Speed reading would be nice. Or a photographic memory. For the movies, I quite liked American Beauty but then I do love Kevin Spacey. Completely agree with you about Lost in Translation though. H didn't care for it either. I'm not much of an action fan so tend not to be interested in most of the huge blockbusters. I'm obviously in the minority there. I wish I had the Bewitched super power of being able to wiggle my nose and having my house clean itself! Nat - I could really use the gift of speed reading--with photographic memory. LOL I usually like Kevin Spacey too, but that movie just didn't sit well with me. Julia - I hope you enjoy it, Julia, when you get to it. Hi Wendy! I'm with you on the power I would choose if I were given the choices. I'll pick telekinesis too! One Night Stand: What's in a Name?